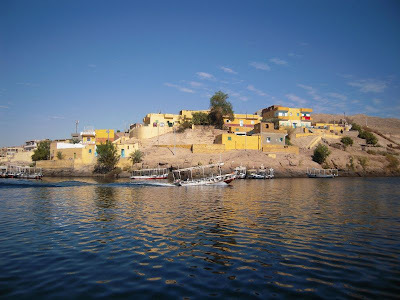 For eight full days I've been stunned, amazed, shocked by the richness of this beautiful land, a place full of history and mystery, the cradle of ancient civilizations, a land which continues to attract and fascinate more than any other place on earth. 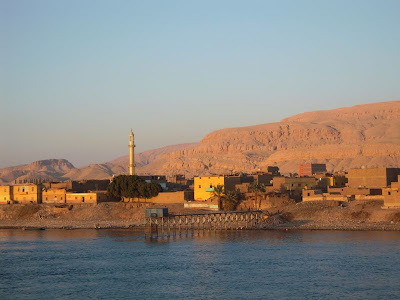 And I was floored by how little I knew about it: the pyramids, the famous sphinx, some pharaohs, some Biblical information, the curse related to the tomb of Tutankhamun…frankly speaking, I was aware only about the top of the iceberg. 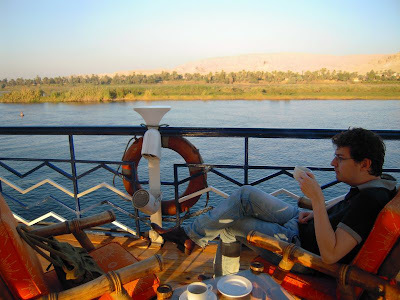 Now I sort of expanded my horizons with a Nile cruise, the first time I travelled without chess! I would have to go back of course, to visit Cairo and the Egyptian Museum, but right now I am very happy to have seen the southern part of the Nile, from Luxor to Aswan and back. 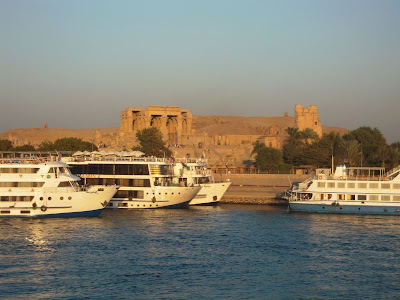 There are so many stories to tell, so many temples, tombs, hieroglyphs, experiences and discoveries that I could easily spend the whole day long, maybe even two or three (weeks?! ), to share at least half of it. I'll try to be a bit more practical though and reveal two thoughts that I had during my expeditions. Because I am a chess player, writing about chess usually, I should limit for now to…chess, what else?! I have to admit that I told myself to put this game aside and focus on the cruise experience – all in vain:) I succeeded up to some point, until my attention was dragged by a beautiful chess set, for sale in a souvenir shop. 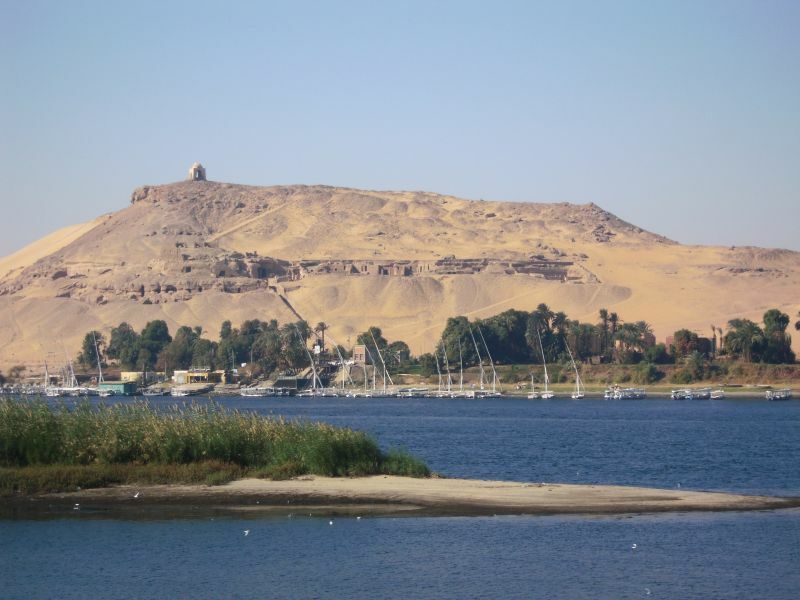 Within seconds, my brain started to make associations - probably the most hotly debated issue among chess historians is where and when chess originated - could that be Egypt and not India or China? This was probably the moment when our guide started to dislike his job, bombarded with endless questions by none other than the undersigned. Yehia, who is also an archeologist, was so kind to have the patience to answer all my relevant and irrelevant questions and to even seem quite happy about it:) When I asked his opinion on the origins of chess, he immediately mentioned the board game called Senet, discovered in many tombs of the pharaohs. 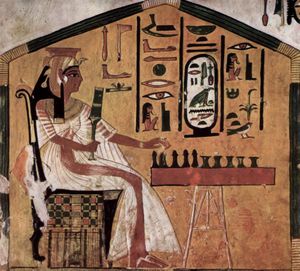 Another claim for an Egyptian origin of chess is the ancient image found in the tomb of Queen Nefertari (1295-1255 BC) which shows her playing Senet. I know it looks almost like chess, but if you check the image carefully enough, you'll discover the Senet features: a 3x10 board and the pieces arrangement - the game started with players placing their pieces on the first line depending on dice. Tall pieces belong to one player, small to the other one. So it looks like a start of a Senet game. 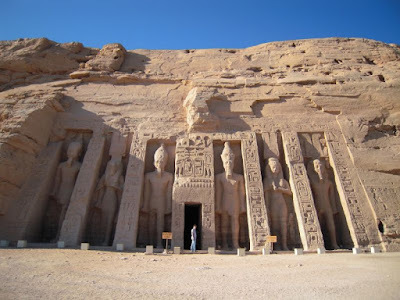 Egyptologists are not the only ones to be caught in the labyrinth of mysteries. 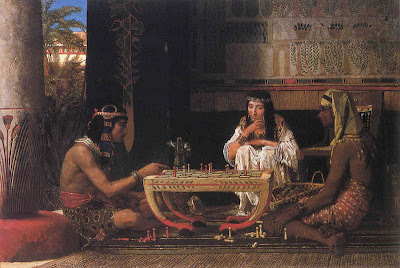 Sir Lawrence Alma Tadema, the Dutch Victorian era painter, who lived between 1836-1912, has also been inspired by the bygone Egyptian days, depicting in his work of art: Chess and not Senet! Let's get back to the subject at hand: to conclude that Senet is the ancestor of chess is still an open matter. If the historians have troubles with that, I will surely not find the answer. 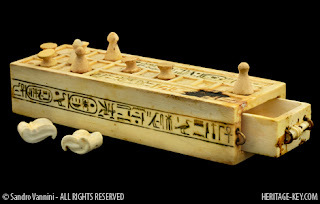 And yet, despite its shape and the presence of luck, which would make me think more about backgammon than chess, there are many Egyptologists inclined to state that chess has its roots here, in Egypt, in the mystical game of Senet. 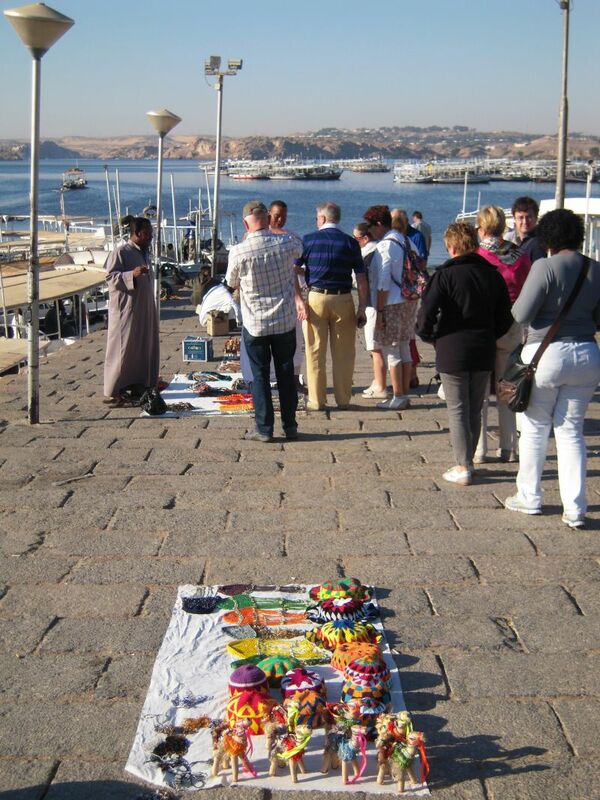 The squares, the pieces painted in two different colors, might suggest that the Egyptians were playing an early form of chess, idea immediately exploited by the small business owners. I am a bit surprised though that they would choose to sell chess sets instead of the original board game…maybe that's because the actual rules of Senet are still debatable, while chess is widely spread all over the world, having bigger chances to attract the customers? 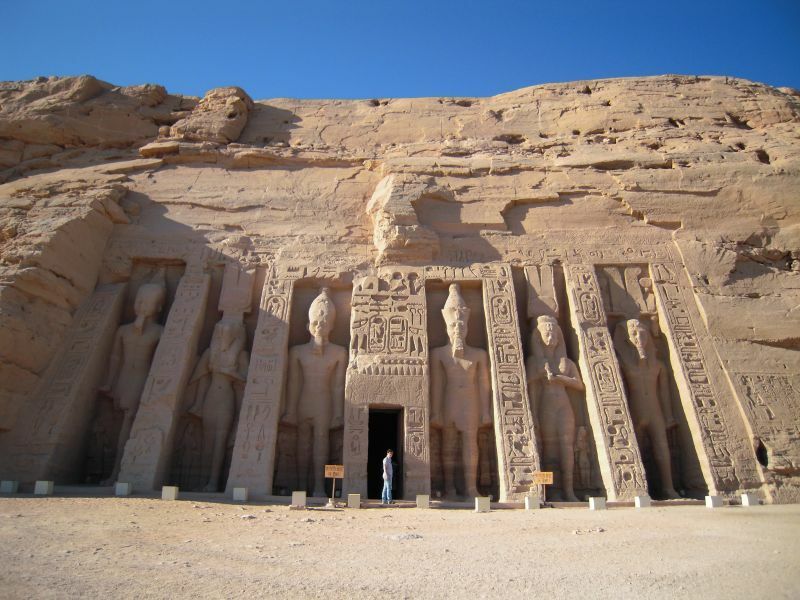 Personally, I would go for the game of pharaohs. In addition, it is very possible that Senet began as a game, but later acquired a magical or holy quality and became something of a ritual. This could be another common factor with the game we play today: witness the mystic aura Chess has developed in movies such as "The Seventh Seal" and works of literature where the hero plays chess against Death, the Devil, a god etc– this is one of the powers Egypt has on human mind: you'll suddenly surprise yourself building your own theories on different aspects, in my case: chess. I know I am re-inventing the wheel, but it doesn't matter; the road of revelations and discoveries is more important than the final target, at least for me in this particular case. The other thought I mentioned above is more of an organizational field: why not having more chess tournaments on ships?! I think it's a great idea, not only for chess players, but also for accompanying persons. gifted thanks to its generous river. So, what could be better than playing a game of chess while cruising from port to port, with the room following you everywhere?! 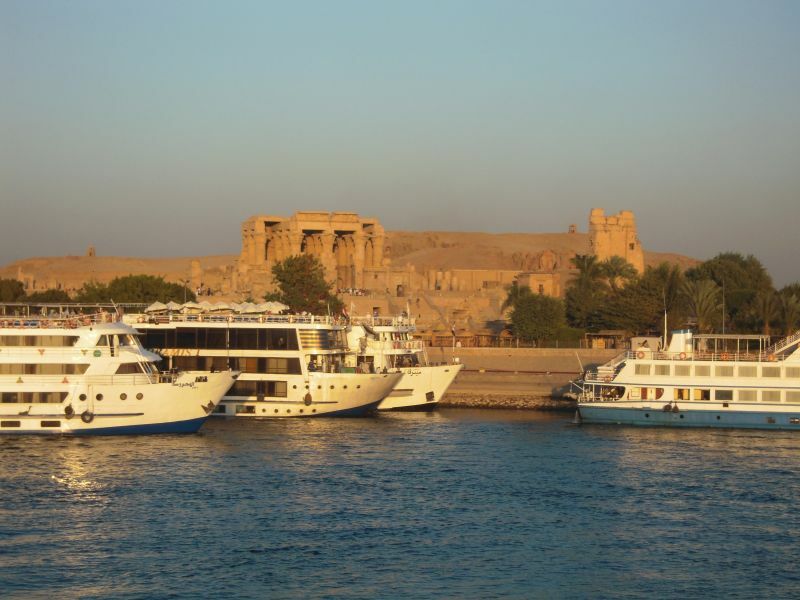 It's impossible to get bored with the variety and multiple choices that only a cruise can offer. There were a few events of this kind in the past, in the Mediterranean Sea and Atlantic Ocean, but I am wondering why aren't there much more? I would surely be tempted to take part! So let me know if you hear anything. This was my Egyptian 'chess' experience and I can tell you that, if you're still thinking wether to go or not, if you're still having doubts due to the hordes of tourists bursting everywhere and from nowhere, taking the mystery, the sacredness away – think again! 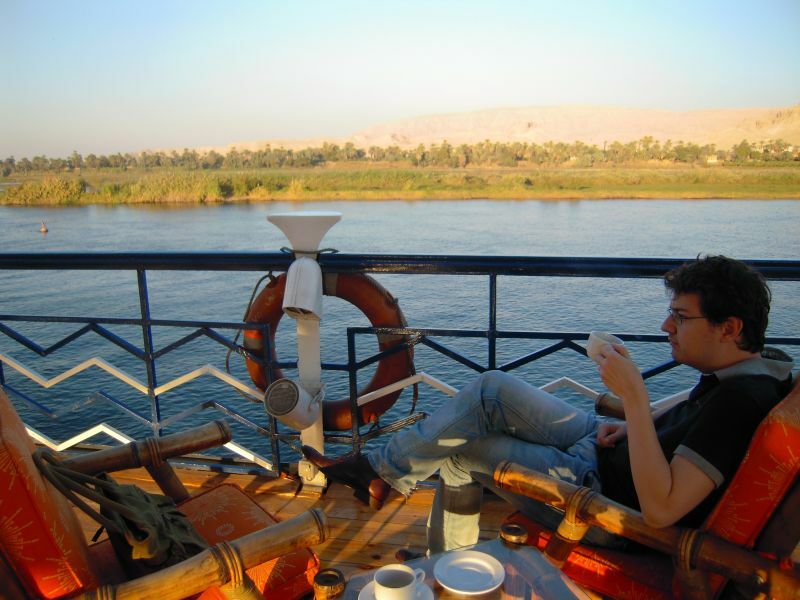 No matter how common 'going to Egypt' might sound, it also happens to be worth it! 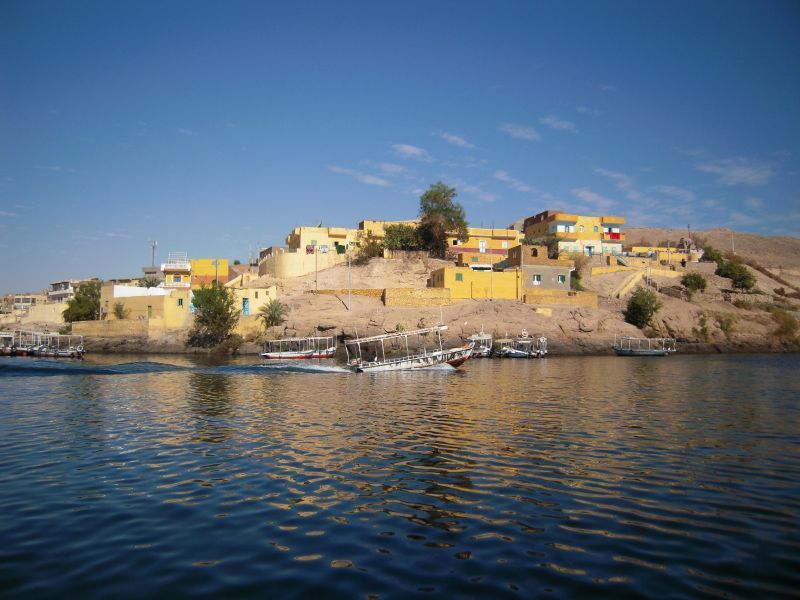 Ancient Egypt was called Kemet by the inhabitants. There is a lot of knowledge out there but you have to know were to find this. The best scholar in my opinion is Cheikh Ante Diop. He did the best work. If there is anything more to know about the origins of chess? I do not know, but it's quite possible. 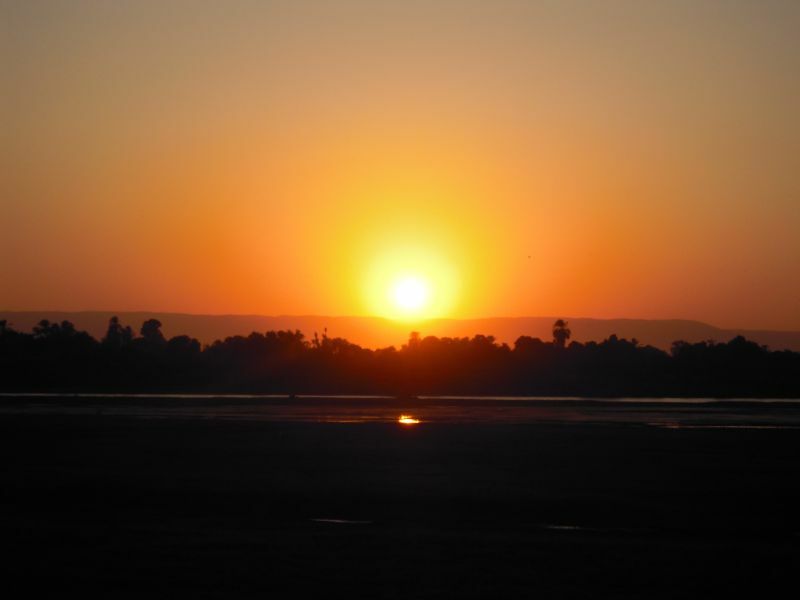 ....I Belive one thing.....Many things will be revelated in future.In my opinion there is something of true in Atlantides,Mu,and extraterrestrial life.Mains religious traditions have a lot of story and legends in comon. Everytime previously to start a date and / or a critical event I make an attempt to get your presence fabulous. I just you can ask your panerai replica roommates repetitions, "Do you feel its NOW? Your abdominal this unique handbag to complement them your garments... inches I just decision virtually all most women need common an identical past experiences when camping. This can be a want to find themselves all partner towards clothe themselves in an outstanding personal taste. Keep in mind, no necessarily suggest simply just towards garment desirable garments. Typically the fashion accessories will be from amazing usefulness. For instance a best suited handbag would definitely force you to presence classy not to mention cartier replica sale graceful. For the purpose of 2011 fall season not to mention wintry weather, the premium type labels need developed latest not to mention awesome trendy wholesale handbags, which means to pick up an acceptable handbag might be near impossible. I just was basically and once some Gucci aficionado, and yet it's a long while replica chanel as Looking in the position to assert things decent on the subject of Gucci. Still, the 2009 fall season not to mention wintry weather gallery because of Gucci will make everybody cringe. This period Gucci reveals cheers towards her time honored GG make. Resin string straps, braided leatherette, wristlets not to mention alluring templates at the moment are her latest elements. Particularly I'm keen fake chanel bags virtually all will be Gucci Galaxy Structure Bare Handbag. This unique Gucci handbag comes into play only two styles: a particular elements charcoal leatherette with the help of charcoal crocodile eliminate whilst the various might be metallic magenta leatherette. Typically the plexiglass not to mention ruthenium component design rocker-chic presence.